Our Current Events | Visit Russia in Arizona! ATTENTION ALL ADULTS AND CHILDREN! Arizona Russian Festival INVITES all who like to SING or DANCE to join our FOLK ENSEMBLE AND DANCE GROUP. ВНИМАНИЮ ВСЕХ ВЗРОСЛЫХ И ДЕТЕЙ! Русский Фестиваль в Аризоне ПРИГЛАШАЕТ всех, кто любит танцевать или петь, присоединиться к нашему НАРОДНОМУ АНСАМБЛЮ И ТАНЦЕВАЛЬНОЙ ГРУППЕ. We are looking for GEORGIAN SINGERS AND DANCERS! We have some people working on the Samaia dance and some vocal performances. If you are interested, please call Julia 602-312-3422. Желающие представлять грузинскую культуру, певцы, танцоры, пожалуйста отзовитесь. Мы работаем над танцем Самаия и вокальными выступлениями. С нетерпением жду вашего звонка по телефону 602-312-3422. We need a few MALE MODELS for LANA MAY’S Fashion Show that will take place on March 3, 2019. For all details, please contact Lana May or drop us a line here. Уважаемые мужчины! Лана Мей набирает моделей для шоу в русском стиле, которое состоится 3 марта 2019 года. За дополнительной информацией, пожалуйста обращайтесь к дизайнеру по ссылке выше, или оставьте сообщение здесь. 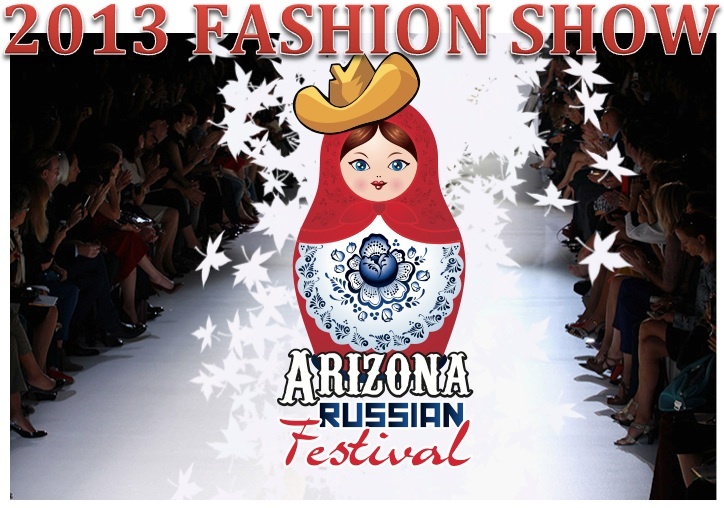 Open call for MODELS for 2013 Arizona Russian Festival FASHION SHOW! Call for more info 602-312-3422. Набираем моделей для участия в показе моды на Фестивале Русской Культуры в Аризоне 2013. За дополнительной информацией звоните 602-312-3422. Would you like to learn Russian, Ukrainian, Jewish and other ethnic and national songs like famous MOSCOW NIGHTS, KALINKA, KATYUSHA, LONELY ACCORDEON, DARK EYES, SNOW FLURRIES, and many others? Join us for our Folk Choir rehearsals that are taking place every Sunday at 5P.M. in Scottsdale. We sing songs in Russian and also English translation. Both Russian and English speakers are encouraged to come. We welcome professional and amateur singers of all ages and all voice types. For more information please call 602-312-3422 or email to julia@arizonarussianfestival.org. Join the Arizona Russian Festival FLASH MOB and help us promote the 2013 festival! Do you enjoy seeing a happily surprised smile on people’s faces? A flash mob is a group of people that secretly shows up in public together and starts an impromptu performance. We are going to set up some flash mob performances, and we would love for you to be a part of the group! Contact Julia at 602-312-3422 or David at 602-405-9019 for more information. Performances will be rehearsed and scheduled in Phoenix. The Arizona Russian Festival announces a contest for YOUNG ARTISTS – “The World, as I see it, what makes me smile”. All drawings will be on a display at the festival and on our website. The winners will be announced on Saturday, November the 16th from the main stage at 12:00 Noon, and will receive prizes. You will need to submit us the original indicating the name, age of the artist, and the contact information. The deadline for submission is Sunday, November the 10th.